The years 2016-2017 can be noted as a time of implementation of major legislative changes in different legal areas, including that of real estate. As a result, Ukrainian real estate law became much more flexible and predictable. The establishment, transfer and cancellation of ownership and other property rights can be done by a notary without the involvement of any state bodies and on the very same day when the underlying transaction takes place. The same relates to mortgages, which in case of default can be enforced (transfer or sale of mortgaged property) directly by a notary. This gives a person great confidence in the creditor. A rather disputable novelty is the establishment of a special commission at the Ministry of Justice which is called to supervise and, if there is justification, to cancel transactions carried out by notaries or state registries. In fact, this commission has sort of quasi-judicial powers and takes decisions about cancellation of ownership or property rights which are typically the prerogative of a court. Major changes have been introduced to construction laws, resulting in total alteration of classification of constructions into five categories of complexity. Instead, the new system is based on impact (liability) classes, namely minor impact (CC1), medium impact (CC2), and significant impact (СС3), which corresponds with the European approach. We should expect that under the new system, buildings belonging to the third category, which could be constructed by submitting a declaration, will instead require a construction permit. Positive developments on the regulatory real estate framework are greatly welcomed. Based on what we see on the market, 2017 will be a promising year in terms of increases in real estate transactions, especially those relating to the sale of assets enforced by banks in the last couple of years. Increasing interest from potential investors is also pointing in that direction. The Ukrainian real estate practice of Baker McKenzie has an exceptionally strong standing on the market. The team is widely referred for expertise in real estate development and construction projects, leases and property mortgages, property investment financing, structuring of international real estate transactions, sales and acquisition, including land issues. The office has a steady flow of commercial, retail, industrial and residential leasing transactions, land acquisition and development, and construction projects. Over the past year the firm advised a number of international and Ukrainian companies, including Amstar Europe, ArcelorMittal, Auchan Ukraine, Billa Ukraine, McDonald’s Ukraine, KFC/GRG. The firm’s team advised US and British investors on the sale of their 100% shareholding in 1849-Apollo Overseas I Limited, the founder of Atlantic-Pacific Ventures LLC, which owns and manages the shopping center Pyramida, to Dragon Capital. Another landmark representation in 2016 was acting as legal counsel to Cargill with respect to an agreement with MV Cargo to enable the construction of a new port terminal in Ukraine’s Black Sea port of Yuzhny. The sizeable practice team is guided by managing partner Serhiy Piontkovsky, head of the firm’s energy, chemicals, mining and infrastructure and real estate practice groups; and Lina Nemchenko, partner of the real estate practice group. DLA Piper has one of the most recognized real estate teams on the market and proliferates its presence across retail, infrastructure and industrial sectors. The firm has of late earned a number of mandates for transaction support and expansion. For example, the Kyiv practice team renders legal support to long-standing client Leroy Merlin DIY in its expansion in Ukraine. Another significant recent highlight is advising CULT Fashion Group, a Ukrainian fashion retailer representing a number of brands in Ukraine (Sonia Rykiel, Polini, Brian Atwood, etc. ), on the conclusion of lease and re-negotiation of the commercial terms of lease in the Central Universal Department Store (TsUM) in downtown Kyiv to open a multi-brand shoes and clothes boutique. The team has remarkable clientele, including Leroy Merlin Ukraine, McDonald’s Ukraine, Starwood Hotels & Resorts Worldwide, Inc., Bomond Group, DataRobot, Syngenta, Assos Capital, Jabil Circuit. In addition to strong transactional capabilities the firm extended its offering with real estate litigation and commercial arbitration. Natalia Kochergina, the practice head and partner, is esteemed for her extensive portfolio of projects and strong expertise. Vasil Kisil & Partners commands a reputable team known for extensive commercial, industrial development and residential projects, financing, assets transfer, as well as a solid litigation caseload. Among the sound mandates is ongoing advice to Seven Hills, the Ukrainian branch of international real estate subdivision of BSG Investments, on the first Ukrainian residential development project Park Avenue. The firm continues to develop its practice in mining and provides comprehensive legal advice to Hubei Changyang Hongxin Industrial Group Co., on acquiring shares in a Ukrainian company, which has special permits for the development of a manganese deposit in Ukraine. The notable representation of late is acting for Epicenter K on the acquisition of a group of buildings of the former Alta Center Shopping Mall. As for construction, the firm represents Pioneer Hi-Bred International, Inc. and Du Pont Corp. regarding construction of a seed plant in Ukraine. In the previous year the team was busy with a series of disputes regarding leasing of land plots for New Century Holding. Alexander Borodkin, partner, enjoys market recognition. Real estate and construction is one of Arzinger’s key practices. The firm is actively present in commercial and corporate real estate transactions, advises on land plot acquisitions, construction, FIDIC regulations, leasing. With industrial clientele on board and a well-versed regional network of offices in Lviv and Odesa, the firm is constantly preferred as counsel of scaled industrial real estate projects. Industry wise, the client assignments for real estate work come from agriculture, energy, hospitality, financial, construction sectors. Managing partner and experienced practice head Timur Bondaryev is a widely-known figure in the real estate market. Over the last couple of years, Dentons has rapidly expanded its practice through new mandates and clients. The office covers real estate and land work in terms of its M&A and corporate matters workflow, especially in agriculture, energy, retail sectors. The past year was noted for a number of comprehensive projects, in particular, advising COFCO Agri on complex real estate and land law issues in connection with the construction of a transshipment complex for grains and oilseeds and their products at Mykolaiv seaport. The firm constantly enhances its cross-border capabilities and, at the same time, is often hired for lease contracts and regular advisory, representing BIIR on various real estate issues with regard to lease and potential construction project. Myron Rabij, the head of real estate and energy practices, is present in the Kyiv and New York offices. The CMS Cameron McKenna team has developed a fully-integrated real estate practice, and advises local and international developers, investors, credit institutions and public authorities on key aspects of real estate transactions. In the outgoing year the office was enlisted by international clients on arbitration, corporate/M&A, financing, construction. The firm is at the forefront of energy and infrastructure projects. In particular, it advises Vestas on a number of construction matters, including drafting of the core construction agreements for four wind power projects in Ukraine; and rendered support to MV Cargo on a joint venture with Cargill for the construction of a new grain terminal in Yuzhny. In the area of financing, the team acted for Alfa-Bank on restructuring of a USD 67.5 million financing of a hotel/office complex in Kyiv. Renowned in the energy sector, partner Vitaliy Radchenko is the core contact of the practice, since Danial Bilak was seconded to the Ukraine Investment Promotion Office. Other important team members are Natalia Kushniruk and Kateryna Chechulina. AVELLUM, as led by managing partner Mykola Stetsenko, is known for its experience of asset deals, structuring investment into real estate and construction, and growing arbitration profile. Notably, significant developers, investment funds and banks are among the clients. The firm covers the real estate side in terms of M&A and finance support. For example, it provided legal support to UniCredit Group on real estate matters with regard to the sale of its business in Ukraine to Alfa Group, and advised world leading investment funds as owners of the majority of USD 470 million notes issued by Mriya Agro Holding PLC on various real estate matters. The firm works especially actively in the area of shopping and entertainment malls. Sayenko Kharenko commands a multidisciplinary team of specialists in dispute resolution, M&A, tax and finance law. Most recently, the firm has been active advising on real estate acquisition and development, leasing, land rezoning, real estate equity and debt finance, real estate securitization, land allocation for oil and gas companies, and alternative energy projects. The firm acts for Soufflet Group on potential investment in the infrastructure of state-owned Illichivsk seaport. Having retail clients on board, the team is hired for investment projects across different regions of the country, as well as instructed for regulatory and land work. In addition, the firm also advises on highly complicated restructuring and real estate litigation. Nazar Chernyavsky and Michael Kharenko are involved in complex investment objects and finance matters; Sergey Pogrebnoy and Sergiy Smirnov are in charge of real estate litigation; Vladimir Sayenko, Konstantin Gribov and Oleksandr Nikolaichyk are focused on transactional support and privatization. Andrew Zablotskyi, known for his proactive presence in the agrarian sector, focuses on infrastructure issues. Eminent national real estate practice Gramatskiy & Partners is one of the leading counsels in the real estate sector. The team focuses on issues related to commercial real estate and residential construction, as well as lease and sale. For many years now their stronghold has been the construction area, including investment projects in infrastructure and public-private partnership, support for construction of residential and commercial premises, and their subsequent servicing. A recent highlight was advising GRAAL, LLC in connection with the reconstruction of European Square and construction of the Stolychnyi multi-storey office and hotel complex in Kyiv; support to Panorama-Invest LLC (City Capital Group) with construction and certification process of the trade centre market. The real estate practice is led by its founder, Ernest Gramatskiy, while the construction industry is handled by Iurii Zabiyaka. Asters is focused on real estate transactions across all types of property, including property development and transactions, corporate and financial structuring, security, litigation and tax issues. Most recently the practice team has been especially active in office and commercial property, as well as industrial construction. Asters has become the port of choice for investors, developers, retail networks, construction companies, property brokers and financial institutions. Among wide-known ongoing projects of the team is advising PRADA Group in connection with the operation of its first mono-brand boutique in Ukraine and Crossfit Ukraine regarding the lease of various real estate objects in Kyiv for sporting and recreational purposes. The lead partner is Roman Kostenko. Integrites sharpened its focus on commercial real estate matters, advising leading investors and developers. The practice team possesses experience in the sale and purchase of real estate and land property, development and construction projects. The firm advised VA Intertrading in connection with forward contracts’ financing secured by real property; Güriş AS on acquisition of land plots (leaseholds and freeholds) and development of wind farms in Ukraine; supported Astarta in an investment project related to the construction of a regional logistics center. The team is also known for constant advice to Novarka with respect to construction of shelter facilities at the Chernobyl Nuclear Power Plant. Among the notable ongoing projects is advising Su-Yapi Engineering and Consulting Inc., one of the leading Turkish engineering and consulting companies, on reconstruction, capital repairs and re-equipping of the Urengoy–Pomory–Uzhgorod gas pipeline. The dispute team is involved in litigation and mediation work. The firm’s client list includes BIONIC Hill Innovation Park, VTB Bank, EBRD, Ukrrosmetal, Astarta, Rikon Group, Kviza-Trade, Allseeds, and others. Managing partner Dr. Oleksiy Feliv is a well-known figure on the market, outline for his BD skills. AEQUO handled a number of notable property transactions, real estate acquisition and property management, as well as public sector projects. The firm also advises on the restructuring of real estate assets located in Crimea in connection with its occupation. Its recent performance took in advising Dragon Capital Investments Limited on the acquisition of the Pyramid Shopping Mall. The firm is very active in advising major retail chains, and is regularly hired for supporting regional projects of its clientele. The firm is also engaged in port infrastructure projects. In particular, it advised TIS Group on group restructuring, real estate and regulatory matters related to a greenfield grain terminal project development in Yuzhny port. Three partners manage projects of the practice, namely Denis Lysenko, Anna Babych and Yulia Kyrpa. Ilyashev & Partners renders advice to companies in various industries, especially high value litigation, sophisticated construction agreements and acquisitions. With a presence in industrial and infrastructural construction, the firm advised Ukrainian Chemical Products (Group DF) on the construction of the Stremygorod Mining and Concentration Complex in Zhytomyr Region; advised OLAM Ukraine on the building of a grain terminal in Odesa Region. The firm advised Czech Development Agency (CzDA) during construction of premises for educational institutions evacuated from the armed conflict zone in Eastern Ukraine. The practice currently represents one of the investors in the Respublika trade and entertainment center in a loan recovery dispute with a bank. Managing partner Mikhail Ilyashev heads the practice. Egorov Puginsky Afanasiev & Partners Ukraine possesses experience in transactional real estate matters, assisting clients with legal, financial and tax structuring of real estate transactions and state registration. The team is present in development projects and acquisition of residential real estate, lease, resolving disputes. EPAP Ukraine advises Salini Impregilo S.p.A. on restructuring of its Ukrainian assets and operations in connection with the disposal of Todini Costruzioni Generali, and further operations; acted for Regal Petroleum Plc with respect to acquisition of LLC PROM-ENERGO PRODUCT. The highlight of its work is supporting the Univermag Ukraina mall across a spectrum of legal matters, including negotiation and registration of leases, advice on operational issues and risks related to commercial real estate in downtown Kyiv. Oleg Boichuk, partner, leads the practice. EQUITY (called FCLEX up till June 2017) stands out for supporting large domestic industrial majors and investors, as well as its recognized litigation capacity. Since 2009 the team has been working on a scaled project to develop the Belanovo field of ferruginous quartzite and construction of Belanovo Ferrexpo mining; and is involved in a project to construct the first pulp line in Ukraine. The firm works on a range of disputes regarding the Respublica shopping center, and continued to provide legal support for a client in disputes on multi-level parking in Sky Mall, one of the largest shopping centers in Ukraine. Vyacheslav Krahlevych has headed the dedicated team for many years and manages advisory and litigation instructions. Spenser & Kauffmann spans its activity on supporting real estate and land use in connection with commercial, residential and investing activity, including acquisition of land and real estate assets, development, financing and leasing. An established client, UkrAvto Corporation, instructed the team with the process of allotment and registration of leasehold on land plots. The firm advised Yuyue Home Textile Cо., Ltd, a Chinese textile company, in connection with the process of the factory’s construction for the production and processing of flax. Partner Aleksandra Fedotova and counsel Maksim Maksimenko are the core practitioners. Notably, the firms got involved in scaled infrastructure projects. In particular, Volodymyr Yaremko1, counsel, advised a contractor on various issues in a project worth more than EUR 100 million project financed by the EBRD and EIB for construction of the Beskyd Tunnel in Western Ukraine based on the FIDIC Yellow Book. Over the past year the real estate practice of Wolf Theiss has in the main advised industrial companies, constructing and commissioning their properties at their own cost. Among the recent highlights is advising ADMIRANDA Group on acquisition and development of a hotel complex in the Istria area, Croatia; counseling Erste on the contemplated sale and transfer of a portfolio of non-performing loans, inter alia, granted to finance real estate project, and financial lease agreements, executed by Erste/its related entities with respect to real estate properties. In addition to transaction work, the Kyiv office handled a number of real estate dispute resolution cases representing mortgage holders, property owners, and construction companies. Managing partner Taras Dumych is the practice head. Olena Kravtsova and Oksana Volynets are the core team members. EY Ukraine has a dedicated team of lawyers which performs narrowly specialized projects in the sector and provides input on issues that invariably arise in relation to M&A deals. For instance, EY advises Rozetka, the largest Ukrainian e-commerce company, on acquisition of a warehouse complex in the city of Brovary from Secure Property Development & Investment Plc. Another current representative work is advising one of the leading developers in Kyiv in connection with real estate development agreements. The main practice figures are Albert Sych, partner, and Bogdan Malnev, senior associate. In 2016 ANK Law Office, one of the main Odesa-based legal counsels, supported clients purchasing internal silos for expanding storage facilities of grain cultures. The past year has been marked as a record for long-term land lease agreements with port operators working in the Odesa and Chornomorsk seaports. The office acted as legal counsel to several stevedoring companies which have successfully legalized their rights over the land plots located under leased open warehouses and other state-owned immovable property (Olimpex Coupe International, Metalsukraine Corp Ltd, Brooklyn-Kyiv, Kernel). The practice is supervised by two partners, Alexander Kifak and Dmitriy Kolodiazhniy. In 2016 Eterna Law extended the list of its clients in real estate practice by advising a range of international investors and Russian developers on the territory of Ukraine. The firm is involved in construction projects, corporate assignments, real estate and land acquisitions, and post transactional support. Among the areas of particular focus are infrastructure, especially ports, energy, hotel industry. Corporate and M&A partner Oleh Malskyy supervises the practice team. Antika, Ukrainian law firm, has a distinctive focus on real estate development and construction projects, as well as commercial transactions. The firm acted as a legal advisor to Heitman in the sale transaction of a logistics center in Boryspil, Kyiv Region, to Dragon Capital Investments Limited. The long lasting project of the team is support to AWT Bavaria on construction of the new BMW Importer and Dealership Center in Ukraine. Alexander Burtovoy is a lead partner. 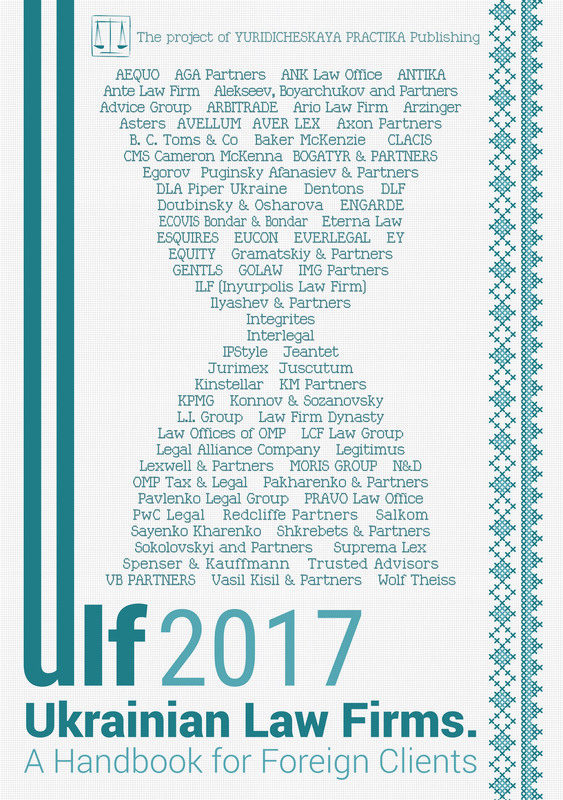 ILF (Inyurpolis Law Firm), a domestic law firm with offices in Kyiv and Kharkiv, is primarily focused on litigation, in particular, ownership and commercial disputes. The clients’ following is traditional for the firm and comes from the healthcare and agrarian sectors. Another recent feature of the firm’s caseload is protection of assets because of nationalization in occupied Crimea. Last year the firm acted in the interests of Diamant-Agro and represented it in ligation concerning a land plot; defended the interests of the owner of industrial premises and a car fleet. ILF litigation partner Alexey Kharitonov leads the practice. KM Partners has provided legal support at all stages of real estate and construction, and reported on a vast number of matters, including representing multinationals in respective disputes. The practice benefits from cooperation with a strong tax team and is a port of call for investment projects. The current workload of the team features construction disputes, disputes against supervisory authorities in architectural control, fire protection, ecology; broad-based construction support, including land title registration, permissive documents, construction agreements and financing. Maxim Oleksiyuk is the main contact. Ante Law Firm is highly active in the aviation sector and is a point of choice for significant industry players. Most recently the firm advised Emirates with regard to lease agreements in Ukraine and big duty free shops operator Pavo Group in connection with their business in determining conflicts with lessees at airports. The firm deals on a permanent basis with real estate issues at airports in the interests of airlines (lessors). Andriy Guck, partner, is the core rainmaker. Law Firm Dynasty, with its head office in Dnipro and an office in Kyiv, showcased involvement in commercial and office real estate transactions as well as evolving business centers. The recent scope included lease premises and sale, construction, regulatory, land and tax disputes. The workflow at the practice is divided among partners Denys Mirgorodskiy, Evgeniy Smiyuha and Vyacheslav Kohlyakov and Antonina Selivanova. International AS, the Czech company providing engineering and construction services in legal and tax structuring issues of transactions with real estate investments; Real Estate Consulting Ltd (REC) in corporate, tax and litigation issues. SDM Partners provides support regarding various projects including initial advice on the best legal models for putting investments, obtaining all permits and licenses required for construction projects, purchase and sale/lease of land plots, change of land zoning. Over the past year the firm rendered comprehensive legal support to a multinational agriculture holding in leasing agriculture land plots in various regions of Ukraine. Serhiy Dzis is a lead partner. Lavrynovych & Partners, as led by Maksym Lavrynovych, provided comprehensive legal support to its private clients in the acquisition of residential real estate in Kyiv and on investments in commercial real estate in Austria. The firm has a traditionally strong litigation practice, and is enlisted for resolution of commercial and administrative disputes. International Legal Center EUCON has an active litigation practice group rendering property cases, construction and land disputes, and wide-ranging advisory featured with a multidisciplinary offering. Thus, Plastics-Ukraine, LLC received advice on legal due diligence and real estate property acquisition. Tetiana Samsina, senior partner, supervises the practice. Alexandrov & Partners, under the leadership of Dmytro Alexandrov, traditionally provides a range of services for agrarian clientele offering specific land law advice, especially agricultural land lease and extension of land banks. Other areas of recent focus include commercial real estate lease and structuring investments in construction projects. Public clients include Trigon Capital and ISA Prime Developments. Oksana Kryzhanivska, partner, is another key practitioner. Lexwell & Partners renders advice on construction, property acquisitions, land lease. The firm advised Garant-N, LLC (Group of Amstar) in connection with the construction of a residential complex; advised on potential acquisition of a logistics centre. Andrey Kolupaev and Igor Nagai make up the core input of the practice. Advice Group, the Lviv-based domestic counsel, managed to attract predominantly foreign clients seeking support in Western Ukraine. Recent highlights included complex legal assistance to Belgian furniture producer HIMA NV; legal due diligence for a new production facilities construction project in Ivano-Frankivsk by a major agricultural company with Danish investment; comprehensive legal services to Austrian Airlines AG opening a new Client Services Center in Lviv. Oleh Kyryievskyi and Anton Podilchak are the points of contact. Shkrebets & Partners, a vivid Kharkiv-based law firm, is active in municipal projects. The firm has been chosen by the Department of Communal Services of the Kharkiv City Council to support the scaled reconstruction of the Taras Shevchenko garden and Kharkiv Zoo. Alexey Meniv guided work in the sector. Vdovychen & Partners, founded by Oleg Vdovychen, protects clients in economic courts and law-enforcement agencies in connection with administrative and commercial disputes, as well as criminal proceedings. The firm is also enlisted for contractual work. Peterka & Partners, headed by Tatiana Timchenko, acts on lease, sale and purchase of real estate. Most recently the office advised Regus Podil LLC, a Luxembourg multinational corporation that provides a global workplace (offices), with respect to real estate lease. Headed by partner Andriy Tsvyetkov, Gestors acts on property rights and acquisitions issues. The firm advised TRK INVEST, in connection with reconstruction, commissioning and executing the ownership right to an office building. De-Jure, the Odessa-based law firm, handles deals on property selling/purchasing, making legal opinion on the property. In 2016 ENGARDE advised on issues of acquiring land plot with the purpose of building a new agricultural processing enterprise. Market insiders named Vladyslav Kysil, KPD Consulting law firm, for experience in real estate matters.